One morning in 1953 apprentice plumber Harry Martindale was installing a new central heating system in the cellars of the Treasurer’s House in the shadow of the Minster. Suddenly he heard the distant sound of a horn, which became gradually louder. Then a great carthorse emerged through the brick wall, ridden by a dishevelled Roman soldier. He was followed by several more soldiers, dressed in green tunics and plumed helmets. It looked as though they were walking on their knees – their lower legs and feet were nowhere to be seen. Then the ghostly crew moved into a recently excavated area, and it became clear that they were walking on an old Roman road, the Via Decumana, which had been buried 15 inches below the surface. The building also claims to be home to several other ghosts, including a dog, a black cat, George Aislaby (killed in a duel), and Frank Green, who converted the interior into what it is today. The Tapestry Room has an oppressive atmosphere, and is where the wife of a former owner murdered him after he conducted one extra-marital affair too many. Lund’s Court (linking Swinegate and Low Petergate) was formerly known as Mad Alice Lane, in honour of Alice Smith who lived in the lane until 1825, the year she was hanged at York Castle for the perceived crime of insanity and apparently only guilty of being ‘mad’, Alice drifts along the lane that now holds her name. A theatrical ghost, the Grey Lady haunts a room behind the dress circle of the Georgian Theatre Royal. In medieval times, as the story goes, this was part of the old Hospital of St Leonard, which was run by an order of nuns. One young nun fell in love with a nobleman and the pair became lovers, but when her scandalous behaviour became known she was thrown into a windowless room – now part of the theatre – which was bricked up to become her living tomb. A gruesome tale, but apparently if the nun in her grey habit is spotted in the dress circle it’s a good omen for that night’s production! Once known as the most beautiful of York’s many ghosts, this long-haired, elegant apparition has frequently appeared at All Saints Church, Pavement, one of the city’s most striking churches, and is in the habit of welcoming funeral processions at the door. Perhaps, a turbulent spirit who was herself denied a Christian burial? 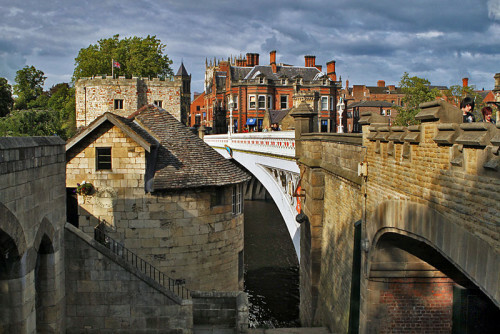 St William’s College, the beautiful medieval building behind York Minster, which is today a much sought-after conference venue and popular eatery, harbours a ghost with a very guilty conscience. Apparently in 16th century York, two brothers were lodging at the College and, desperate for money, hatched a plan to rob a wealthy priest from the Minster. They mugged him, stole his jewellery and purse – and slit his throat. The younger brother was overcome with remorse, and the older sibling feared he would give the game away. He reported his brother to the authorities, and stood by while he was tried and hanged for murder. The elder brother died soon after, racked with guilt. But his unhappy spirit paces the floors of St William’s College to this day. Could the finely dressed Tudor lady who walks through walls at the King’s Manor be the ghost of Queen Catherine Howard, who was King Henry VIII’s guest here in 1541? The lady carries roses in her hands, and the part of the building where she has been spied was once the Rose Garden. Catherine, the fourth of Henry’s six wives, was executed shortly after her stay, and possibly the fact that she entertained her lover Thomas Culpeper in the Manor didn’t help her chances of a long and happy marriage to the fickle Henry. Thomas Percy, the Seventh Earl of Northumberland, has been seen decapitated in the churchyard, searching for his severed head. He lost it after upsetting Elizabeth I by attempting to raise an army to fight her, and she vented her anger thus. A ghostly nun has also been reported on the site. Thomas Percy, Earl of Northumberland, was executed for treason in York: as a staunch Catholic. He was beheaded in 1572, and his head stuck on a large spike on Micklegate Bar as a warning to anyone else with similar ideas. There it remained for many years until eventually recovered and buried in the churchyard of Holy Trinity church in Goodramgate. The body of the Earl has been seen on many a night staggering between the graves, searching for his mislaid head. A six year old Victorian girl who fell to her death on the staircase now haunts this building. She can be heard walking the stairs, and has also been seen sitting on top of a shop counter. Both seen and heard, this ghostly child starved to death after her parents died from plague. She only appears to haunt the upper parts of the house. This pale young lass with long curly hair was seen a number of times, always observing funerals from the church door. She vanished suddenly if anyone approached. Late at night one female witness approached the toy shop window to look at a teddy bear. At the window she entered a dream-like state – she ‘became’ a large male baker covered in flour working within the shop, and looking out from the shop she could see Roman soldiers walking past. An on-duty policeman passing the church late at night heard funeral music playing within the church. As he approached to investigate, the doors of the building opened and the sound of people leaving could be heard, but nothing could be seen. The church was said to have a more frequent phantom visitor – a tall man who would stare out of the windows in the early hours of the morning. Towards the end of World War 2, a drunken Canadian pilot fell from an upstairs window in the building, and broke his neck on the pavement below. Since then, this ghost has reportedly haunted the bedroom from which he fell. Another building used to house injured Civil War troops, the basement is said to be the place where amputations occurred, which explains the sound of cries and screams. Two black cats are also reported to haunt the pub, and an old woman has been seen on the stairs. The Chinese call Britain ‘The Island of Hero’s’ which I think sums up what we British are all about. We British are inquisitive and competitive and are always looking over the horizon to the next adventure and discovery. I have recently decided to write articles on my favourite subjects: English Sports, English History, English Icons, English Discoveries and English Inventions. At present I have written many articles which I call ‘An Englishman’s Favourite Bits Of England’ as various chapters. Please visit my Blogs page http://Bloggs.Resourcez.Com where I have listed my most recent articles to date. Previous Previous post: So you think you can smoke pot and still drive?